So I’ve been a health-food nut for awhile now…. I grew up eating pretty healthy, my mother was the one who cooked, and even though she worked a full-time job she still made sure we ate low-fat, non-greasy, mostly homemade foods. But because she was working so much, about half the food we consumed was packaged and processed foods – foods that are low in nutritional value and protein, but high in salt & fat (making them addictive and easy to over-eat), additives, and preservatives. Now that I’m a wife and mother, I’ve managed to largely cut out most of the processed foods we eat daily. Sure we still have some crackers in our pantry, I still sometimes cook with flour, and we let our son eat white bread, but the majority of the food we eat is as close to homemade or natural as we can get or make. We eat this way because our health is a priority to my husband and I. We are an active family, constantly going, and I want to be active even in our old age together, and that starts with what you take into your body. 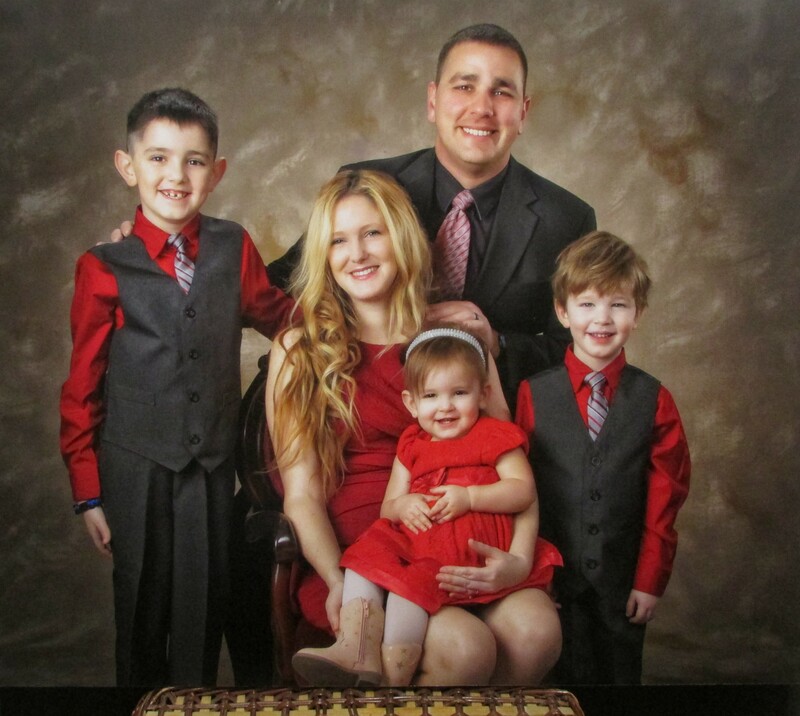 We are also that family that eats healthy regularly at home, but doesn’t think twice about eating a donut every week, or eating out at our favorite fast food places sometimes. When eating healthy is simply your lifestyle, you aren’t worried about ordering a pizza, or eating a high fat, high calorie burger with fries sometimes. So we are those people who look really fit, but who you’ll see eating out and enjoying ourselves regularly, we don’t believe in sticking to a super strict diet. This means that around the holidays, we do tend to indulge in those incredible comfort foods more often than not, and then modify our exercise and diet lifestyle come January. Our love is to enjoy the seasons, and we’ve embraced that the holiday season in particular, is one filled with foods that we normally don’t eat year round. We embrace the tastes, the pleasures of eating those gustatory delights, but we equally embrace eating clean again come the New Year on. Europeans (especially the French) tend to live that way. They aren’t as obsessed with cutting out all carbs or certain food groups, wine, or doing insane diets for short periods of time, because the way they eat daily is beneficial to their bodies – they aren’t gaining weight because they typically just don’t over-eat. They also stick to natural, mostly unprocessed foods… even their chocolate is healthier because it typically has no high fructose corn syrup, modified starches or milk products, and more cocoa %). When French women in particular, do happen to notice they might be gaining weight, they simply step up their daily exertion – like taking the stairs instead of the elevator when they feel a shirt or dress becoming tight. They self-moderate their weight because they are in tune with it and their bodies, they eat slower as well, which helps them feel when they are full. Summer is the season when our food lifestyle starts to be really harrowed down to the necessities for survival, however, we still eat so that we don’t feel deprived. 1) Fresh cut fruits …. The best way to ensure that your fruit won’t go to waste in the basket is to, as soon as you get it home from the market, find some time to slice and dice it into portions that are easy to pull out for a snack or for the lunch sides. It saves so much more time and will keep you from reaching for packaged snacks like goldfish that are just empty calories. Make sure you have a variety of fruits and veggies stocked up and sliced each week so that your family doesn’t get bored. We do bananas (obviously no need to slice except for smoothies if you use them that way), apples, kiwis, peaches, oranges, watermelon (we cube it – also easy for smoothie throw-ins), and anything that piques our interest while out at the store. 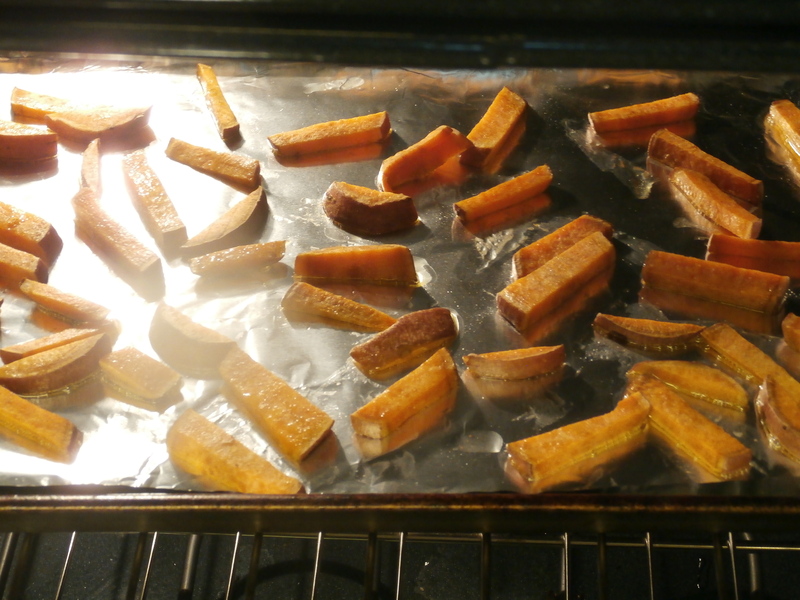 2) Ready to bake Veggies fries or chips …. 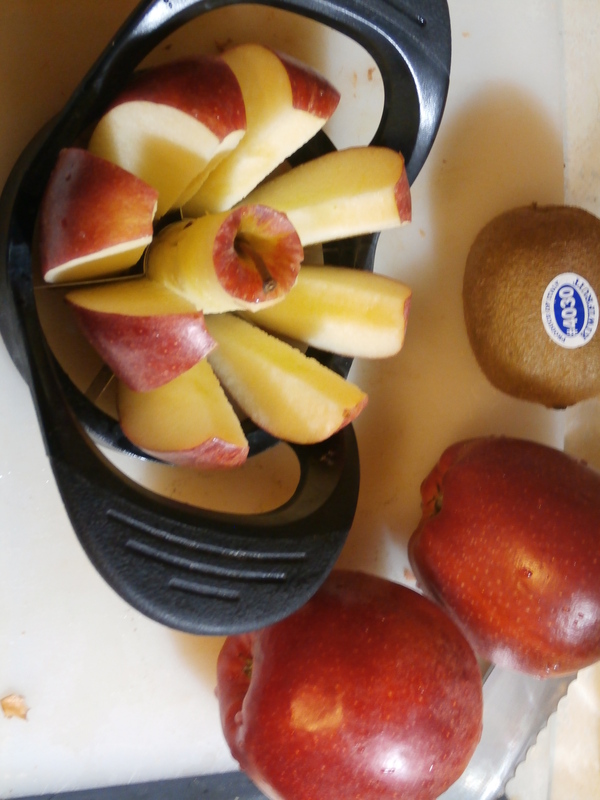 Same principle as the fruits, cut them into slices or fries or “chips” as soon as you can so that they are ready to go. This works well with sweet potatoes which are one of the super foods for your body, zucchini, butternut squash, or kale (kale chips). When they are cut like this and are ready to go, it makes getting dinner on the table so much easier – and rather than reaching for some prepackaged or processed dinner side, you’re getting something natural and raw. 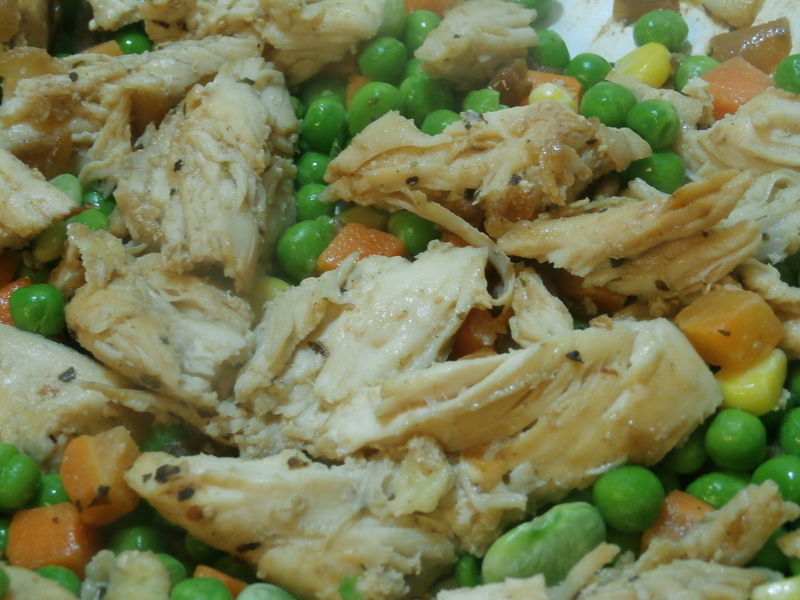 3) High protein snacks, lunches, or side dishes …. Two words, Greek Yogurt. I usually grow our own yogurt during the Summer when it’s hot (I do it a med-evil way… I suggest you buy a yogurt maker!! ), and separate out the whey so that it becomes the “Greek yogurt” sold in the stores. It is INSANELY cheaper to make your own yogurt (I make about a half gallon for $3 every week) rather than buy the individual cups they sell at the store. I once had a woman trying to sell me the store brand of their yogurt, and I told her I had started making my own. 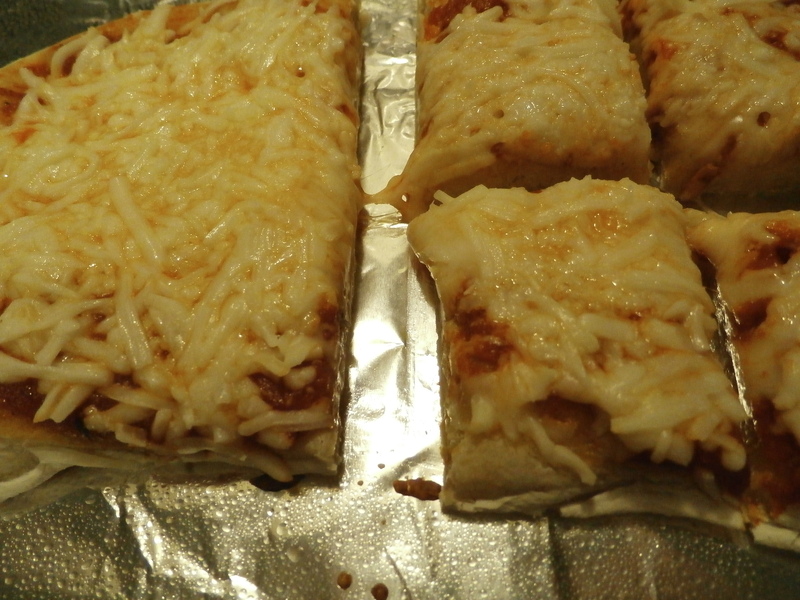 She was excited, asked me how to do it, and told me that when she used to live in Italy, a family next door used to do that, and it tasted incredible. More proof in my mind that Europeans understand how to eat better than Americans. Another plus about homemade yogurt, you don’t have to worry about the preservatives added, high fructose corn syrup, dyes, or fillers. If you do have to buy it, make sure you buy it plain, as close to natural as possible, and try to avoid a brand that has High fructose corn syrup. Greek yogurt is delicious and one of the super foods because of the high protein and fat busting properties it has… eat 1 to 2 cups a day replacing one of your normal snacks to see a noticeable difference in your body fat % (it will mysteriously go down) 🙂 . 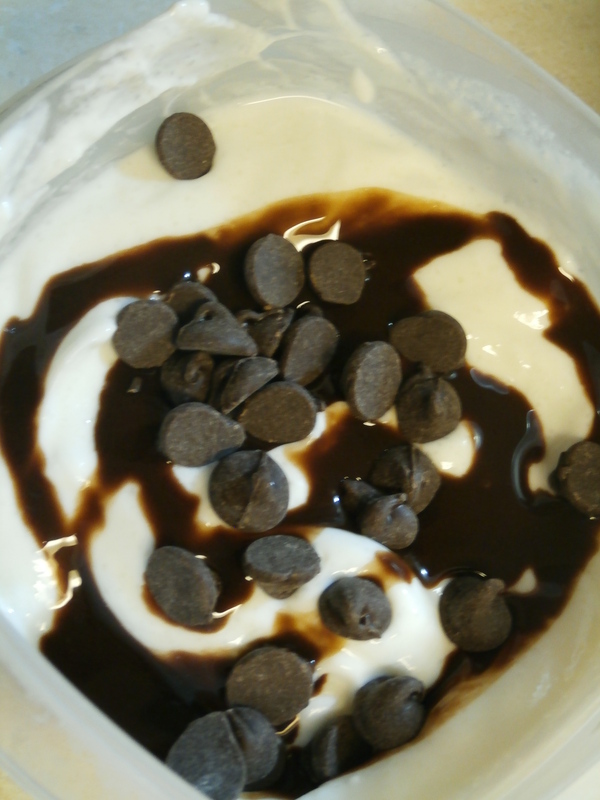 The way my son eats his nutritious, protein packed Greek Yogurt… with a little chocolate sauce, and dark chocolate (anti-oxidant) chips! 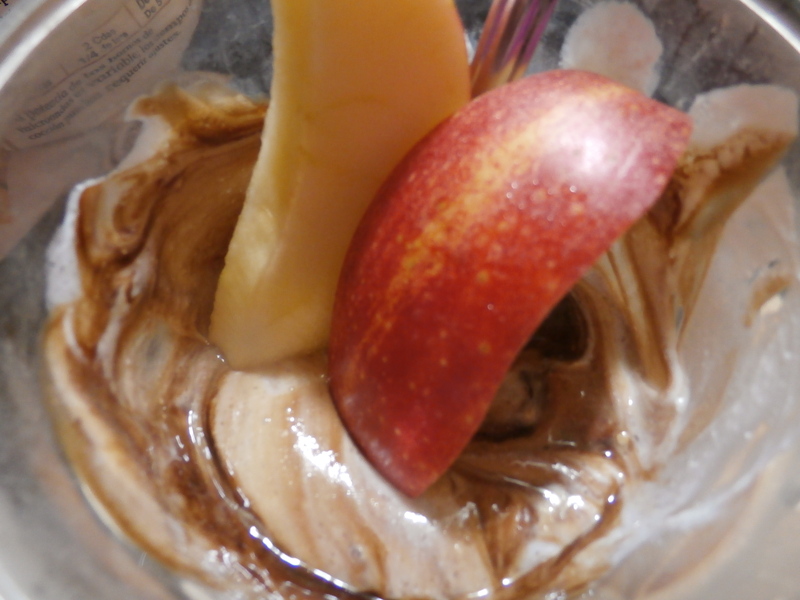 Dress it up however you like… I usually make a vanilla kind or black cherry yogurt (sooooo delicious). You don’t even know you’re eating healthy, it’s like eating ice cream. Limit it to one cup though, and that’s your dessert. 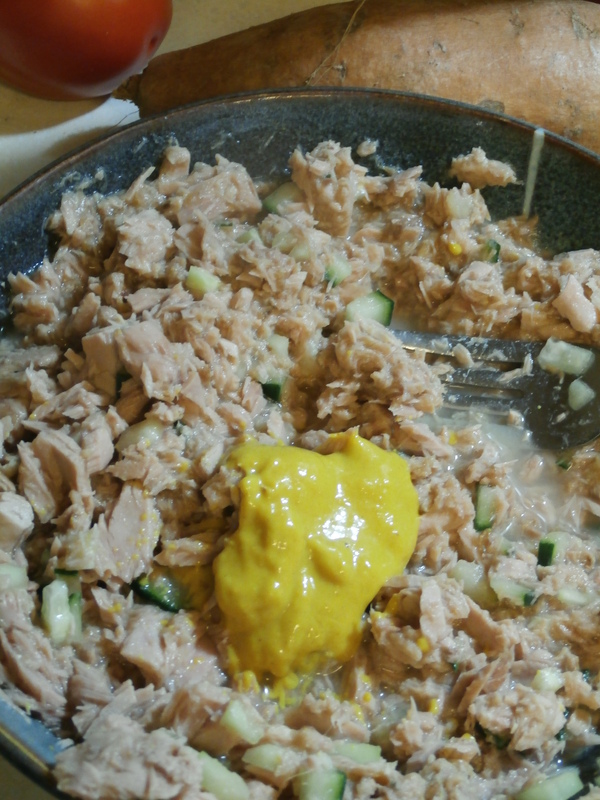 Another great high protein snack/lunch/side dish is tuna or chicken salad… I simply avoid using the fattening sauces when making them and typically opt for 1 tbs of mustard, or for chicken salad… 1 tbs of yogurt to substitute for mayonnaise. The tuna or chicken salads are great for lunch by themselves, or in wheat pita pockets, or as snacks served on crackers. Huge boost of energy if used as a snack! 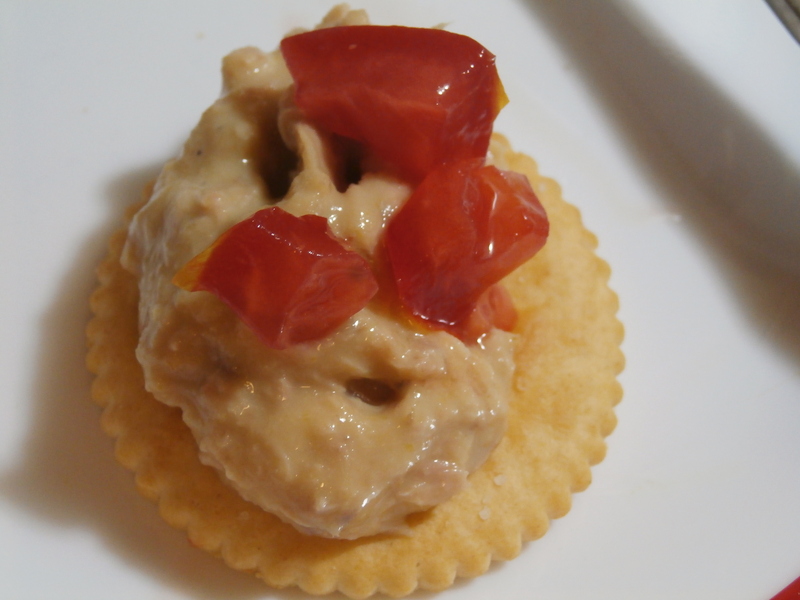 4) Handy veggie snacks …. 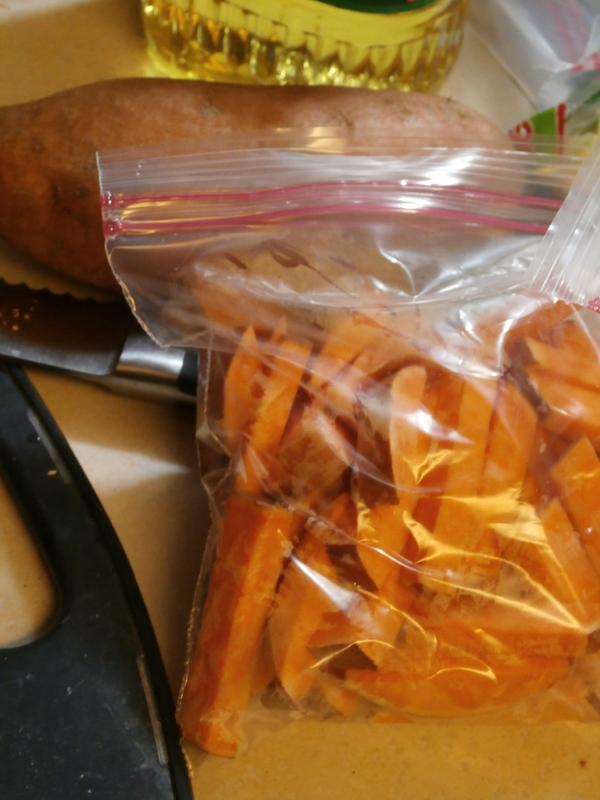 Cut carrots or baby carrots, celery sticks, etc… the key again, is to keep these things cut and sliced, ready to go in your fridge so that you are more motivated to actually eat enough of them during the week before your next trip to the market. We also do use dips, you can create your own easy yogurt dips or just use 3 tbs ranch… a little ranch is great if it will help you or your kids to get down some veggies they’d otherwise never want to eat! Our family’s secret weapon??? The Super food smoothie. Say good-bye to fat as it melts off of you! You get SO MUCH energy from these simple, cheap drinks you make in your own home! This was berries blended, carrots, and peanut butter. 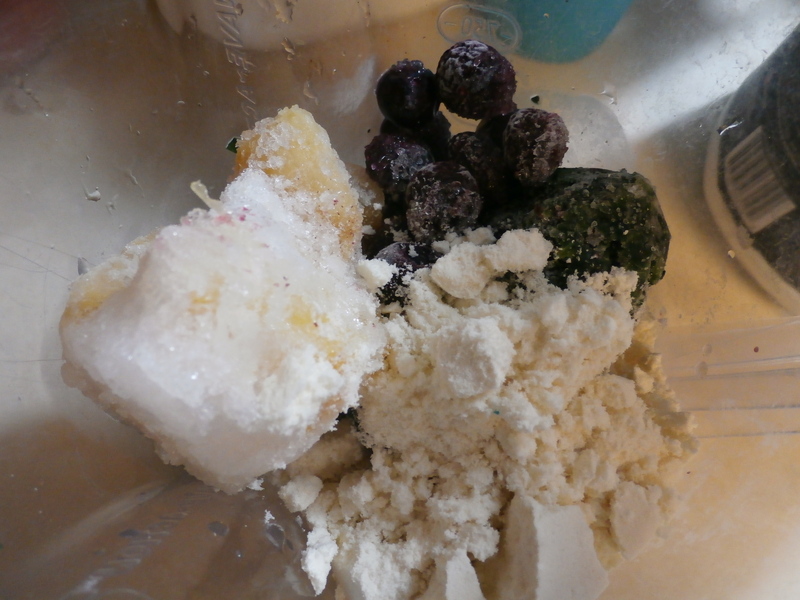 5) Frozen fruits and spinach, kale, and carrots for drinking in smoothies …. This is probably the most unsuspecting thing our family regularly does in the Spring and Summer months. We drink loads of fruits and veggies in smoothie drinks (water or yogurt based), it is kind of like juicing except we really do blend the fruits and veggies. It is hard to describe what it feels like to drink these icy cool concoctions… when I’ve been doing it regularly (daily), it’s like my veins themselves feel cool and refreshed. The fat in your body melts away, your energy is magically increased… it really is our family’s best kept “secret” of the one thing you should be eating (or drinking) in the Summer. Green Drink…. not as tasty haha… but still so good for your body! 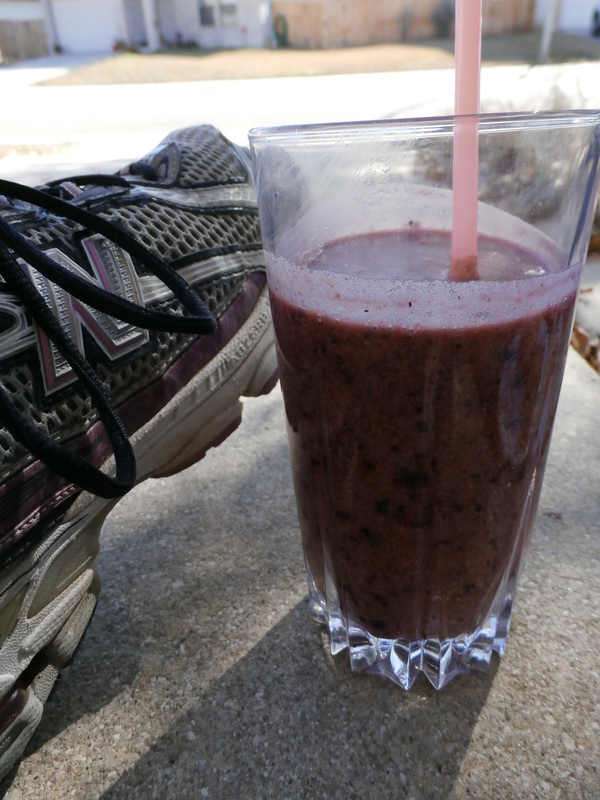 Another thing, these are not the high-fat, sugary smoothies you’ll find at Smoothie King or other smoothie shops. These are no-fat (unless you use an Avocado base or yogurt base – good fat), they have no cream and very little (1 tbs tops) sugar added. They are pure fruit, water, and vegetables. You can make them into a meal replacement for lunch or dinner (or breakfast – I like hot breakfasts so I usually don’t) by adding the recommended scoop of a high quality protein powder. We use Muscle Milk Protein Powder, but there are many good brands out there. You can do so many different kinds of healthy smoothies… “chocolate, spinach, berry blend (my favorite),” or a “berry blend, carrots, and peanut butter (really delicious)” you just have to get creative and try different ways to drink your veggies and fruits. 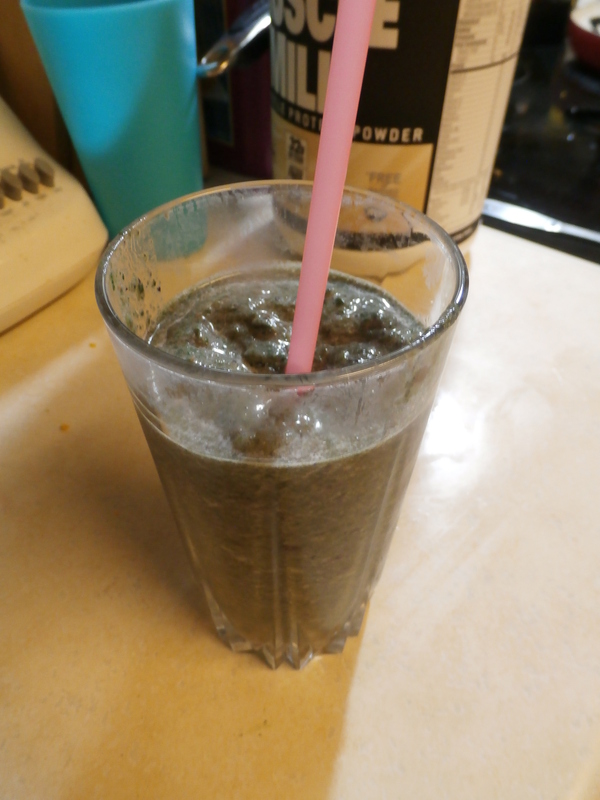 Strawberry, banana, kiwi, + protein powder… Chocolate, peanut butter, spinach/kale blend. The possibilities are endless. And then just make sure to create healthy dinners of low fat (lean) meats, use noticably less starches like rice and corn meal,… use more protein-packed sides like chickpeas, beans, legumes, and grains like quinoa. And eat 1/3 to 2/3 of your dinner in vegetables for a healthy, rejuvenated Summer. I love this tiny woman, and this chili recipe was amazing. 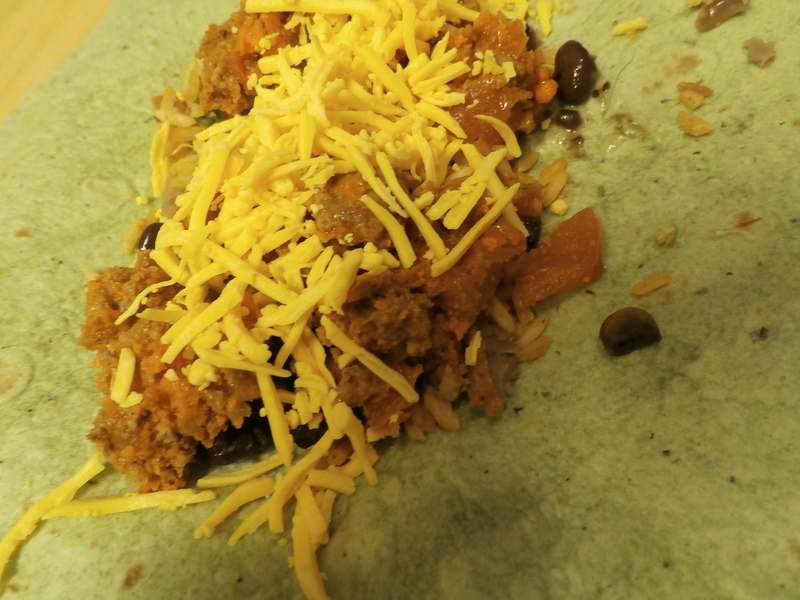 I altered it to add my own black bean recipe because in my mind, they taste amazing together in a wrap or burrito. 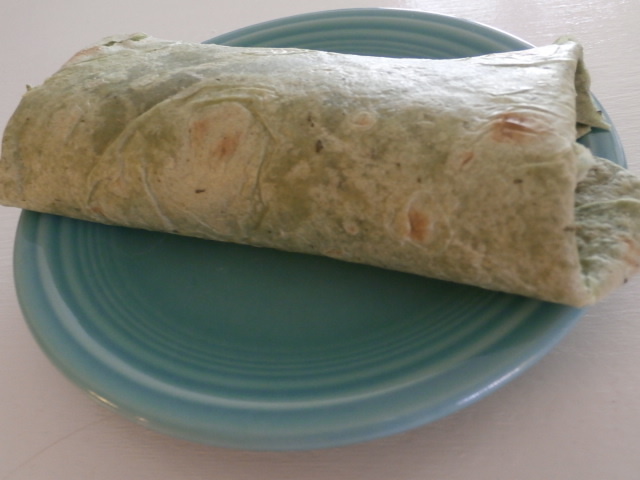 We use those large spinach tortillas since they are our favorite, but you can also get tomato or even jalapeno tortillas to go with this and any kind of wrap you’d want!